The Cass River Watershed encompasses an area of 908 square miles (approx. 578,812 acres), contains 1352 miles of rivers and streams and hundreds of miles of county drains. The Cass River flows to the Saginaw River and eventually to Saginaw Bay. Located in Michigan’s Lower Peninsulas Thumb Region the watershed includes portions of Genesee, Huron, Lapeer, Saginaw, Sanilac, and Tuscola counties. Communities in the watershed include Bridgeport, Cass City, Caro, Frankenmuth, Marlette, Millington, Tuscola, Vassar, and Ubly. 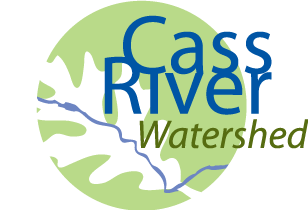 The following are a series of maps, publications, and other resources about the Cass River Watershed.